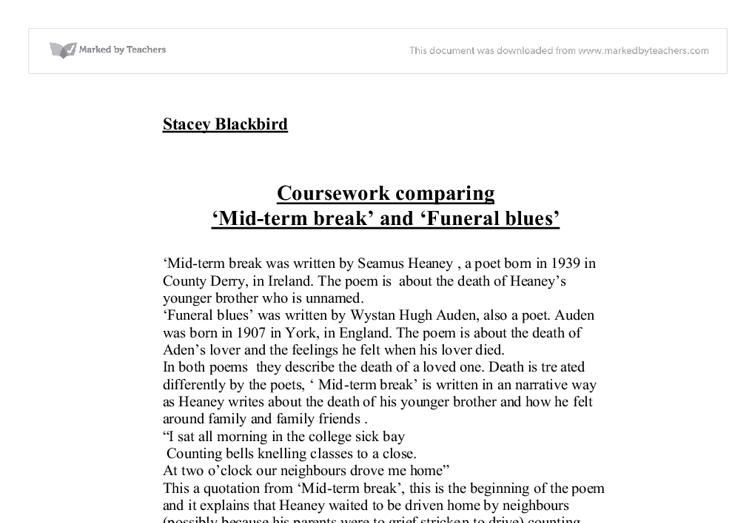 Stacey Blackbird Coursework comparing 'Mid-term break' and 'Funeral blues' 'Mid-term break was written by Seamus Heaney , a poet born in 1939 in County Derry, in Ireland. The poem is about the death of Heaney's younger brother who is unnamed. 'Funeral blues' was written by Wystan Hugh Auden, also a poet. Auden was born in 1907 in York, in England. The poem is about the death of Aden's lover and the feelings he felt when his lover died. In both poems they describe the death of a loved one. 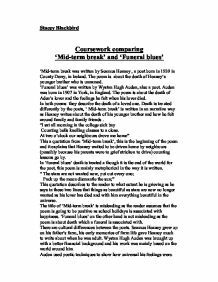 Death is treated differently by the poets, ' Mid-term break' is written in an narrative way as Heaney writes about the death of his younger brother and how he felt around family and family friends . "I sat all morning in the college sick bay Counting bells knelling classes to a close. At two o'clock our neighbours drove me home" This a quotation from 'Mid-term break', this is the beginning of the poem and it explains that Heaney waited to be driven home by neighbours (possibly because his parents were to grief stricken to drive) ...read more. Similarly, Heaney uses metaphor in his poem but perhaps not in such an emphatic and ardent way. "Wearing a poppy bruise on his left temple, He lay in the four foot box as in his cot." This quotation is the only metaphor in the poem and he uses it to describe the bruise on his brothers temple to a poppy. Auden's poem on the other hand has many metaphors and also personification, an example of personification is; "Let aeroplanes circle moaning overhead Scribbling on the sky the message He is dead," This is personification because a aeroplane doesn't actually moan and you associate moaning with grief. The imagery used in the poem 'Funeral blues' is that he describes the grief he is feeling and in it he is very pessimistic as he describes a very depressing scene which is to be expected after you have lost a person near to you. Also 'Mid-term break' does not have any rhyming lines or stanzas as opposed to 'Funeral blues' in which each caplet rhymes. In both poems the themes are death and grief. ...read more. The poem 'Funeral blues' has four stanzas while 'Mid-term break' on the other hand has seven stanzas. I think the ending of 'Mid-term break' has more impact upon the reader as it is very touching and makes you think how awful it must be to lose a child especially one as young as four, one positive thought is that the reader knows that the child died a very quick death and didn't suffer, the reader knows this because of the line; "No gaudy scars, the bumper knocked him clear". this quotation has been repeated in this essay because I needed to explain my point to the reader of this essay. I think the motivation behind these two poems was the emotional effect of losing someone really close to the poets hearts, poets seem to write about events in their lives that affected them deeply and emotionally as these events give them the motivation to write such thought provoking poems. My opinions of the poems is that they are both rather disheartening and my favourite is 'Mid-term break' because it is a narrative poem and more informal. ?? ?? ?? ?? ...read more. We are told his mother 'coughs out angry tearless sighs', like she is chocking on her own grief. The sibilance in that statement also indicates the noise she is making. 'Coughed out' suggests a harsh choking sound that occasionally punctuates the silence. a poignant reminder of the time of year in which the death occurred, and it may be that snowdrops were the only flowers available to the family as an offering to the dead boy. We then learn that this was the first time in six weeks that Heaney had seen his brother, having been away at school. In Digging it is "Between my finger and my thumb The squat pen rests. I'll dig with it". This is contrast because throughout the poem he's been talking about how he didn't dig and this shows that still can, with his pen. This almost "un-poetic" language reduces the poem to its bare essentials and this makes the impact of the awful event stronger and more effective. Just as the body has no "gaudy scars" the poem has no flowery, overblown descriptions. Onomatopoeia, such as "cooed" and "whispers" are used to reinforce the quietness of the poem and of death. The uses of verbs describes this, such as "cooed and laughed and rocked the pram." This tells us that the baby is in a world of its own and has not yet grown up to fully understand the situation. The baby is innocent for this as it has no idea of what a funeral is. For example, in a couple of the stanzas, he uses the word 'hand' to link the verses together. This is a very obvious way of using enjambement but it works really well. As Seamus Heaney walks into the room, he talks about how he was embarrassed to see old men standing up and shaking his hand to show their respect. it was her second son, must also make her feel like Heaney, emotionally hurt, if not worse. When the ambulance arrived with the body, Heaney is once again shocked, and saddened by the sight of his brother lying there, unable to help him, just like the rest of his family.